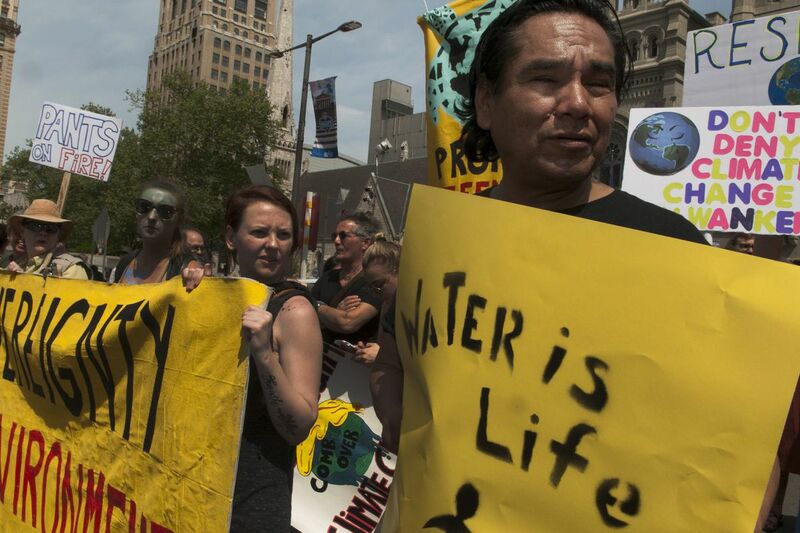 Loren Bagola from Cheyenne River South Dakato marching at the activists rally at Philadelphia City Hall to protest the Trump administration’s environmental policies on April 29, 2017. Looking for ways to conserve water and save taxpayer money on bills, Camden city officials will meet next month with counterparts from a handful of cities, including Atlanta, Detroit, and Cleveland. Philadelphia looked to Seattle, New York, and Washington in crafting an energy-saving program for the city's largest buildings. The City of Lancaster is looking to Victoria, the capital of British Columbia, Canada, for tips on keeping storm drains clear and preventing local flooding. In an ultra-tough economic climate for local governments, municipalities across the country are mining one another's expertise for ways to cut costs while improving quality of life by promoting efficiency, social equity, government transparency, public health, and a clean environment. They are rallying around a particular buzzword – sustainability. And for towns that choose to participate in burgeoning networks of "sustainable" programs, there might even be money in it for them. "It's local communities' mandate to create communities that are livable, that are healthy, that are prosperous," said Nils Moe, managing director of the Urban Sustainability Directors Network, consisting of 185 cities in the United States and Canada. "If we're not looking at our community work with a sustainability lens, we are moving away from that mandate." In the last year, more cities have joined the network because of the Trump administration's intention not to participate in the Paris climate agreement, Moe said. Twelve states, including New Jersey and Pennsylvania, have statewide programs that share information through the National Network of Statewide-Local Sustainability Organizations and use resources and recognition to motivate local communities to embrace sustainability. Sustainable Jersey, which started the national network in 2015, is in the vanguard of the movement. Begun in 2009, it has certified municipalities throughout the state, including Burlington Township, Burlington County; Voorhees Township, Camden County; and Washington Township, Gloucester County. The state group, based at the College of New Jersey, has helped other states, including Pennsylvania, Maryland, and New York, start their own statewide programs. All the programs are "trying to achieve statewide change by getting the individual municipalities to make progress," said Randall Solomon, executive director of Sustainable Jersey. Sustainable Pennsylvania was started four years ago in the western part of the state, and eastern municipalities have more recently joined, said Jim Price, sustainable community manager at Sustainable Pittsburgh. Certified municipalities include Lower Merion Township, Montgomery County; Doylestown Township, Bucks County; and West Chester Borough, Chester County. Usually, municipalities are busy dealing with residents' concerns as they appear and with day-to-day management, Price said. "It's not often they have a chance to step back and look at what they're doing in a holistic way," he said. Although states have different criteria for participation in their programs, they focus on common themes of efficiency and environmental stewardship. Waste reduction, transportation, land use, support for local businesses, environmental justice, and diversity in government are some specific issues communities in the programs address. Municipalities must post documentation online that proves their efforts. They highlight what they're already doing and make changes where they can improve. Even communities that already considered themselves on the path to sustainability said they expanded their plans because of the statewide networks. New Jersey's and Pennsylvania's programs each offer more than 100 sustainability suggestions. "Municipalities, if they're going to survive in the future, they have to figure out how to sustain" themselves, said Daniel Zimmerman, township manager of Warwick Township, Lancaster County. "Fiscally, there's more demands, more challenges to be able to meet your fiscal obligations. Efficiency has got to be a goal." Sustainability certifications also help when applying for state grants. Pennsylvania's Department of Community and Economic Development looks favorably on communities that are certified when considering applications for several programs. Sustainable Jersey has awarded more than $2.4 million in grants to local governments. Specific grants are only open to the 445 communities that participate. More than a third of the state's 565 municipalities have taken the extra steps to become certified. In Pennsylvania, 79 municipalities, or 3 percent, are certified through Sustainable Pennsylvania, which grew out of two decades of work by Sustainable Pittsburgh. Pittsburgh's group partnered with the Pennsylvania Municipal League to spread the practice. The league considers it one of its signature programs, said Richard Schuettler, executive director. "It sends a good message to the public that we as a local government are willing to measure ourselves and make ourselves better," Schuettler said. In New Jersey, Voorhees Township has become more walkable and bikeable because of its participation in the sustainability program, said Mayor Michael Mignogna. Burlington Township, which stopped mailing newsletters to residents years ago to save money, now posts more information on its website, said Jeff Taylor, assistant engineer. Before Lancaster applied for the sustainable certification, the city did not have a sustainability plan and was not moving toward developing one, said Douglas Smith, who became the city's first sustainability planner two years ago. Pennsylvania's statewide sustainability network "helped provide us a road map of policies we should be addressing," Smith said. In December, New Garden Township announced it had achieved Sustainable Pennsylvania certification, mainly to be recognized for its sustainability efforts and to access more funding opportunities. Upper Makefield Township, Bucks County, is one of 14 municipalities across the state that have started the certification process. Philadelphia, one of the first to be certified under Sustainable Pennsylvania, has been collaborating with municipalities locally and nationwide. "If there is an issue we're struggling with and maybe somebody in Pittsburgh or New York or in a small town in Colorado has an idea about it, we can use these networks to understand how they overcome those challenges, and vice versa," said Richard Freeh, senior program manager of Philadelphia's Office of Sustainability. "It's important for quality of life," Freeh said, "for residents and businesses to really feel like the place they live and work is committed to the future for themselves and their families."